Melt semi-sweet chocolate chips and shortening in the microwave for 30 seconds, stir and continue heating and stirring at 15 second intervals, until smooth. Pour the melted chocolate over the crispy chocolate rice cereal and stir to coat. Spread the coated cereal out on a piece of parchment paper to set and harden. Allow the chocolate coating to harden and then break the cereal into bite sized pieces. In a large bowl, mix the softened chocolate ice cream with 2 cups of the crunchy cereal pieces. Spread into a 9-inch springform pan and top with the remaining crunchy cereal, pressing it into the ice cream. Cover the springform pan and place the ice cream cake in the freezer for 6-8 hours or overnight (depending on your freezer) to harden. When ready to serve, remove from the freezer and slide a knife around the edges of the springform pan and then remove the sides. 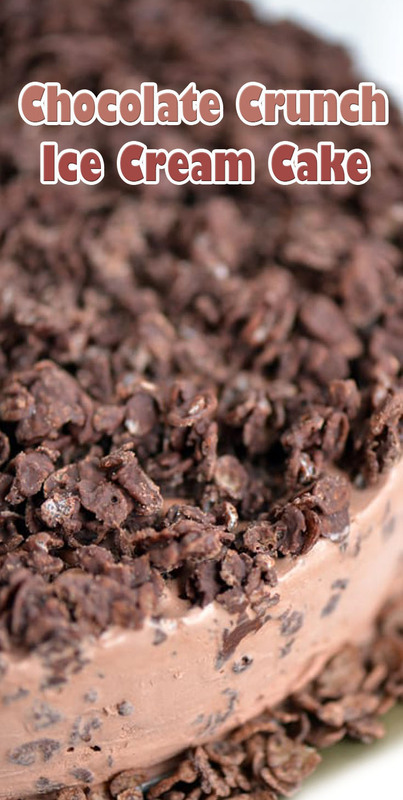 Place the chocolate crunch ice cream cake on a plate or platter. Add additional cereal around the edge of the platter, if desired. Dip a knife in very hot water, quickly dry it off and use the hot knife to cut the ice cream cake. Re-dip and dry the knife for each cut you make.